Note: The summary below is about the potential effects of the currently prepared EU trade/investment agreements CETA, TTIP and TiSA in regards to public water supply. The summary shows the results of a survey relating to the provisions on water supply, sanitation and wastewaster disposal services in these agreements. The survey is based on papers that have been officially published by the EU Commission as well as a continuous and in-depth investigation beginning in 2013. The survey is being complemented by five sheets relating to technical basics and offering reading aid for the texts and annexes of the agreements. The survey was accompanied by a close and continuous exchange with academical and institutional experts including the BDEW German Association of Energy and Water Industries. The summary below is focussed only on water supply and leaves out sanitation and wastewater disposal services. Explanations on technical terms can be found in the survey.Due to given capacity this survey is only available in German on the website of Stadtwerke Karlsruhe. It is noted that the following summary represents the view of Stadtwerke Karlsruhe and that mistakes cannot be ruled out. It is meant to be a contribution to an objective debate and increased understanding of the agreements regarding water supply. In regards to TiSA no conclusions can be drawn as no current information is available. Non-commercial use of the summary is permitted as long as the source is quoted and a copy is sent to Stadtwerke Karlsruhe. 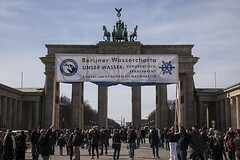 Berliner Wassertisch is a local network of representatives of different groups, initiatives and interested citizens joined under the common theme "Water belongs to us all - water is a human right". As a local area network, they are fighting the partial privatization of the Berlin water companies.